Thank you for taking the time to schedule an appointment with us. If you are looking to schedule an appointment for a cleaning it needs to be with the hygienist. Otherwise please choose what type of appointment you are scheduling for. Dr. Hadi Nouredine is the founding doctor of Family Dental care. He attended Portland State University for his undergraduate studies and then received his dental training at OHSU. He has been in private practice serving the greater Portland Area for more than 20 years since his graduation. 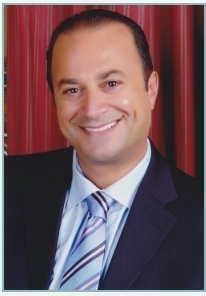 Dr. Nouredine has had extensive training in implants, Endodontics, Invisalign and IV Sedation. His business philosophy is that you treat patients as if they were your own family; this approach applies to Nouredine’s volunteer work, too. He is a longtime supporter of Medical Teams International, which offers free dental care to low-income individuals without insurance, often refugees and new immigrants. Dr. Nouredine attends many continuous educations lectures through out the year to keep up with the most advanced technologies to offer the best treatment options for his patients. Dr. Nouredine plays indoor soccer twice a week, and enjoys spending time with his wife and three sons, Charlie, Sam and Marc. Dr. Hadi is so kind. He made my 5 yr old son feel so comfortable. My son was not scared and was very calm thanks to Dr. Hadi! He goes above and beyond, really great experience! Moved my appointment up to accommodate what turned out to be an emergency. Was very thorough and explained in detail what would be needed and each step of treatment as he went along. The rest of the staff is comprised ofgreat people. I've already recommended him to a friend who was looking for a dentist.